Everything you need to know before you play keno online. Casinos are filled with all sorts of ways to place a wager. Slot machines and video poker take up the majority of all gaming floors, with table games taking up the rest – almost. There’s also that game called Keno. Everyone has heard of it, and most people understand the basic rules, but there’s more to keno than meets the eye. Keno has a little of everything. As the old western film says – the good, the bad, and the ugly. We’ll talk all about keno, what you really need to know before playing. The best part about keno is its simplicity. It’s just like playing a ticket in a lottery drawing, except that the results occur instantly. Some land-based casinos have timed drawings, but online, the drawing always takes place the moment you confirm your wager. The game board consists of 80 numbers (1-80). The drawing will randomly select 20 of those numbers. You can pick anywhere from 1 to 10, 15 or 20 numbers (depending on the specific game you play).The more you pick, the more you need to match to win, but the more you can win for matching them. Pick numbers – watch the drawing – win or lose. It’s that easy. That’s the good part. For a lot of people, the worst part about this game is that it can be very boring. Waiting for all those numbers to pop up isn’t all that exciting, unless you happen to hit your numbers early on. Then you’re too be busy being excited about your impending win to care about the wait. But that’s not usually the case. This is exactly why slot machines are so much more popular. There is always something going on in slots. They do have lower payback percentages than most games, but in terms of entertainment value, the slots have the market cornered. Blackjack is similarly interesting, not because it’s so entertaining, but because your brain has something to do, calculating hand values and working out odds to implement a good strategy. Keno has none of that. Pick your numbers, then wait for the results. Maybe if they incorporate animated dancing pandas into the side of the screen…? 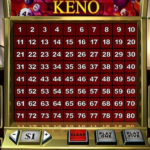 If you enjoy the simplicity of keno, and don’t mind the wait, then there’s one more thing you need to know before you play keno online. It’s the ugly side of the game – the house edge. 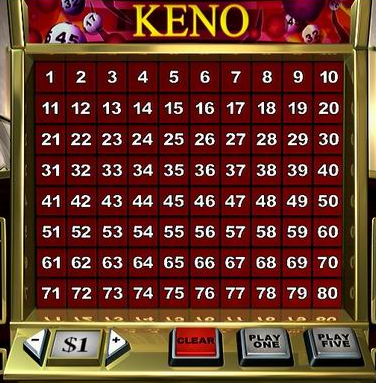 Keno does not offer favorable odds, no matter how you play it. The very best odds you can get are 1 in 4, by placing a bet on a single number. That’s a 75% house edge! You’ll get paid 2-to-1 for hitting it, but that doesn’t make up for it much. Pick 2 numbers and your odds drop to 1 in 17 in games where both numbers must match to get a payout. If the pay table offers a payout for matching 1 of 2, the odds are still 1 in 2.63, which equates to a 62% house edge, but you’ll only get your wager back – no winnings. Simply put, keno is one of the absolute worst games you can play. The payouts may look tempting, but the odds are dreadful.